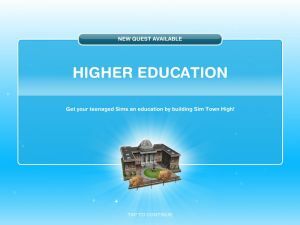 After completing the Teenagers Quest a new quest to unlock Higher Education becomes available. This is not a time limited Quest. 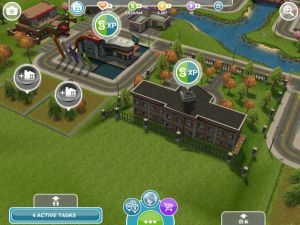 Below are all the steps you need to follow to complete unlock Higher Education in The Sims FreePlay. Anything slightly complicated we'll have details for. Check the list before you start this Quest as sometimes you can save some time by starting tasks that you need to complete later on before the prior task finishes. Rather quick call - Just select a hone and the Call Mom option should be available. This is the Politician Career, if you already have a Sim following that career path, this one won't count for this task, you'll have to get a Sim to start a NEW career as a Politican. 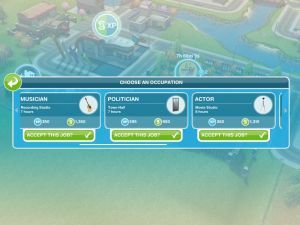 To do this you can go back to The Town Map, select the Town Hall, the Careers and Eduction pop up should come up and then just select a Sim that is not already a Politician, the Choose an Occupation box will pop up and choose the Accept This Job button under the Politician tab. 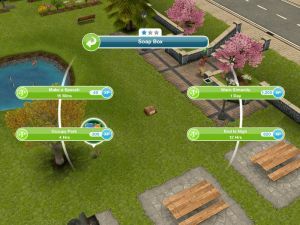 Select the Park and whistle your new Politican over (or any other Sim will do actually if he/she is busy). Tap on the crate in the park and choose the make a speech option. Thankfully at 15 minutes only it's not a great big long boring one. Handily there is a BBQ in the Park to help you complete this task, find it and select the appropriate option. You'll also find the ducks in the Park, select one and choose the bribe option. 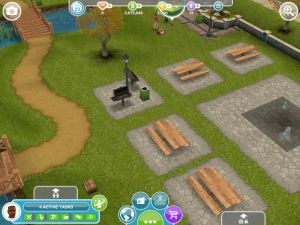 Still in the Park, just select a bench and choose the be inconspicuous option. Good news - If you already had a Politician at level 2 or higher this task will instantly complete and you can move onto the next one. If you don't, well... Just keep sending your Politician to work until he levels up. That was the final task, your high School is now unlocked. You can send any teenage Sim there to further their education. It also unlocks the Teacher Career option.